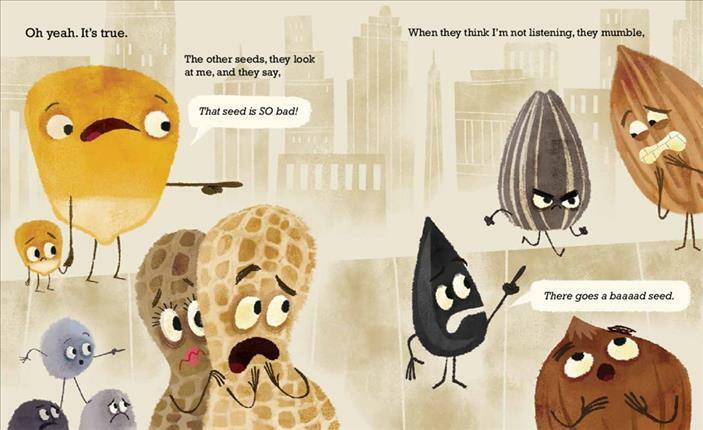 School Library Journal - 06/01/2017 K-Gr 2—Corn kernels, pistachios, peanuts, and other seeds gasp and point as a "baaaaaaaaaaad seed" goes by. When others mumble about him, he can hear them because he has "good hearing for a seed." The bad seed tells "long jokes with no punch lines," lies "about pointless stuff," and never puts things back where they belong. But he did not start out that way; it was only after a traumatic experience that he became "a different seed entirely." Through a mixture of watercolor textures and digital paint, Oswald creates a faded cityscape background. The seeds, on the other hand, have stronger colors and expressive faces. (Their sticklike arms and legs and large eyes make them reminiscent of the California Raisins.) The contrast between the bright, sunlit field and the dark interior of a sunflower seed bag highlights the protagonist's downturn in fortune. Young readers will find the list of all the seed's offenses amusing, and the illustration of the flies and stench surrounding him (he never washes his hands or feet) is sure to elicit laughter. Even the very youngest can follow along as the pictures provide evidence of the seed's bad behavior and the reactions of those around him. This is a story that opens up dialogue about our reactions to life experiences, the consequences of our choices, and the chance to make a change for the better. VERDICT This charmingly illustrated book would be a comical read-aloud and useful for class or family discussions about manners, behavior, and reputation.—Suzanne Costner, Fairview Elementary School, Maryville, TN - Copyright 2017 Publishers Weekly, Library Journal and/or School Library Journal used with permission. Booklist - 08/01/2017 “I’m a bad seed,” this titular antihero proclaims, his angry eyes taking up the majority of the page. 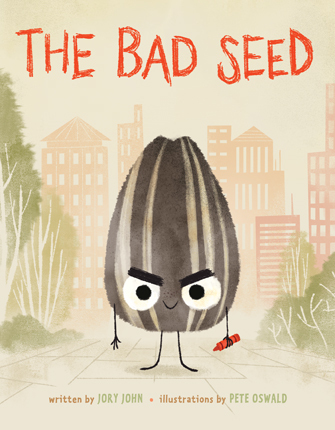 “A baaaaaaaaaaad seed.” Brow firmly furrowed, the little but fierce sunflower seed marches through the city streets while a variety of other seeds and nuts scamper out of his way, agreeing with him (“There goes a baaaad seed”). What makes him so bad? He lies, he’s late, he doesn’t listen, he tells boring jokes, and he never puts things back. Of course, he wasn’t always like that: like many bad guys, he’s got a pretty tragic backstory. But maybe he’s done being bad. Maybe he wants to be good again—if he can remember how. The message, though heavy-handed, is well-intentioned, and the watercolor illustrations provide plenty of comic effect. Young readers will enjoy watching the dramatic seed intimidate his nervous neighbors, and might not even realize they’re learning a lesson about good behavior in the process. - Copyright 2017 Booklist.